"New Hampshire Birth Records, Early to 1900," database with images, FamilySearch (https://familysearch.org/ark:/61903/1:1:FL2R-L2V : 12 December 2014), Cyrus Colby, 16 Jun 1822; citing Bow, Merrimack, New Hampshire, United States, Bureau of Vital Records and Health Statistics, Concord; FHL microfilm 1,000,378. "New Hampshire Marriage Records, 1637-1947," database with images, FamilySearch (https://familysearch.org/ark:/61903/1:1:FL6K-QR1 : 12 December 2014), Emmons C. Colby and Hortense Kimball, 25 Feb 1890; citing Dunbarton, Merrimack, New Hampshire, Bureau of Vital Records and Health Statistics, Concord; FHL microfilm 1,000,976. "New Hampshire Death Certificates, 1938-1959," database with images, FamilySearch (https://familysearch.org/ark:/61903/1:1:QV3Q-53N9 : 9 September 2014), Cyrus Colby, 19 Nov 1950; citing Concord, Merrimack, New Hampshire, United States, p. No 5277-5801, New Hampshire Division of Vital Records, Concord. "New Hampshire Marriage Records, 1637-1947," database with images, FamilySearch (https://familysearch.org/pal:/MM9.3.1/TH-267-11097-129074-58?cc=1520640 : accessed 18 April 2016), 004243145 > image 1952 of 4918; Bureau of Vital Records and Health Statistics, Concord. Massachusetts Vital Records, 1841-1910, , Vol: 29 ; Page: 57. Massachusetts Vital Records, 1841-1910, , Vol: 402 ; Page: 118. "New Hampshire, Birth Records, Early to 1900," index and images, FamilySearch (https://familysearch.org/pal:/MM9.1.1/FL2R-G42 : accessed 12 Nov 2012), Deborah Colby, 06 Mar 1817. Mass. Newbury, Vital records of Newbury, Massachusetts, to the end of the year 1849 (Salem, Mass. : The Essex Institute, 1911), Vol. 2, p. 117. Frederick Lewis Weis, The Colby family in early America; early generations of the descendants of Anthony Colby of Boston, Cambridge, Salisbury and Amesbury, Massachusetts, 1595-1661, , at https://books.google.com/books?id=TXdGAAAAMAAJ . Caledonia: The Colonial Press, (1970) , p. 24. Vital Records of Haverhill Massachusetts to the end of the year 1849, Topsfield, Mass: Topsfield Historical Society, (1911) , Vol. 1, p. 299. Vital records of Amesbury, Massachusetts to the end of the year 1849, , at https://archive.org/details/vitalrecordsofam00ames . Topsfield, Mass. : Topsfield Historical Society, (1913) , p. 250. COLBY FAMILY & OTHERS at http://freepages.genealogy.rootsweb.com/~colby/colbyfam, citing Index to births, early to 1900 New Hampshire. 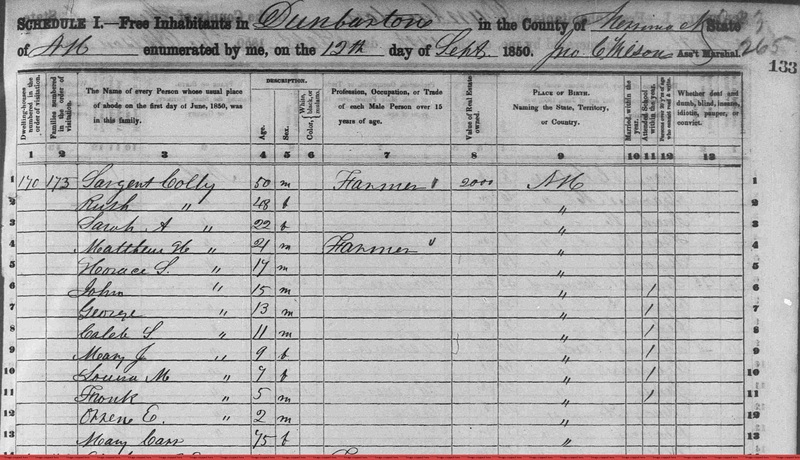 "United States Census, 1930," database with images, FamilySearch (https://familysearch.org/pal:/MM9.3.1/TH-1951-22771-4703-5?cc=1810731 : 8 December 2015), New Hampshire > Merrimack > Concord > ED 26 > image 19 of 22; citing NARA microfilm publication T626 (Washington D.C.: National Archives and Records Administration, 2002). He was the son of John Colby and Mary Frame. She was the daughter of Edward H. Colby and Jennie F. Slye. living at 151 Pleasant Street, Worcester, Worcester County, Massachusetts. Aspiring journalist Edith Colby came to Thompson Falls from Spokane in 1916 and took a job with the democratic Independent-Enterprise. Edith and others wrote some personal attacks on A. C. Thomas, chairman of the Republican County Central Committee, published in the paper. She and Thomas traded verbal insults and Thomas accused Edith of loose morals. Edith was enraged and stole a loaded revolver, which she showed to her boss, attorney A. S. Ainsworth, and her editor, John Manire. Manire showed her how to use the weapon and suggested that shooting Thomas would be good for the newspaper. The two men later testified that they had no idea Edith would actually pull the trigger. But she did. Edith met Thomas on the street and shot him three times. The coroner’s inquest found that both Ainsworth and Manire shared the blame with Edith. All three were arrested. Burton K. Wheeler of Butte, later a well-known political figure, was the relentless special prosecutor. However, the court dropped all charges against Ainsworth, and the judge directed the jury to find Manire not guilty. Edith pled not guilty by reason of insanity, and her mother testified that mental illness ran in the family. living at 5728 Buena Vista Terrace, Los Angeles, Los Angeles County, California. Colby, Edith E. house 5728 Buena Vista Terrace. living at Los Angeles, Los Angeles County, California. "New Hampshire, Birth Records, Early to 1900," index and images, FamilySearch (https://familysearch.org/pal:/MM9.1.1/FL2R-PLG : accessed 26 Nov 2012), Edith E Colby, 20 May 1872. 1900 United States. Census Office. 12th census, 1900 population census schedules, Washington, District of Columbia: Bureau of the Census Micro-Film Laboratory, ([197-]) , Census Place: Worcester Ward 8, Worcester, Massachusetts; Roll: 697; Page: 3A; Enumeration District: 1777; FHL microfilm: 1240697. 1930 United States. Bureau of the Census. 15th census, United States, 1930 federal census : population schedules ; NARA microfilm publication T626, Washington, District of Columbia: Bureau of the Census Micro-Film Laboratory, ([19--?]) , Census Place: Los Angeles, Los Angeles, California; Roll: 161; Page: 2A; Enumeration District: 669; Image: 760.0; FHL microfilm: 2339896. Sixteenth Census of the United States, 1940, Washington, D.C.: National Archives and Records Administration, (1940) , Census Place: Los Angeles, Los Angeles, California; Roll: T627_388; Page: 1A; Enumeration District: 60-1157. State of California, California Death Index, 1940-1997, Sacramento, CA, USA: State of California Department of Health Services, Center for Health Statistics, , Place: Los Angeles; Date: 28 Mar 1942; Social Security: 563123532. Her mother's maiden name is listed as "Todd." COLBY FAMILY & OTHERS at http://freepages.genealogy.rootsweb.com/~colby/colbyfam, citing "A History of Tuolumne County, California" Published by B. F. Alley, 1882. Pg. 337. In 1874, Edward lived in Goffstown, Hillsborough County, New Hampshire, where he built the brick house on North Mast Street, located on the site of the schoolhouse in District No. 13. He resided here for a time, then disposed of his property and removed to Vermont. living at Tilton, Belknap County, New Hampshire. Edward died on November 16, 1916 in Tilton, Belknap County, New Hampshire, at age 68. New Hampshire. Registrar of Vital Statistics, Index to births, early to 1900, Salt Lake City: Filmed by the Genealogical Society of Utah, (1974) Microfilm #1000378 of the Family History Library, Salt Lake City, Utah, birth of Edith E. Colby, 1872, certified by Irving A. Watson, Registrar of Vital Statistics. 1900 United States. Census Office. 12th census, 1900 population census schedules, Washington, District of Columbia: Bureau of the Census Micro-Film Laboratory, ([197-]) , Census Place: Tilton, Belknap, New Hampshire; Roll: T623 944; Page: 13A; Enumeration District: 12.